What will Obama do when goals collide? 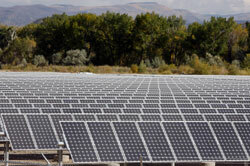 Solar panels in Colorado. (AP photo). Going green is indeed one way to create jobs. But it can also lead to higher food costs, higher fuel costs and the erosion of property rights. Public Citizen's Tyson Slocum wants to know Obama's views on the various tradeoffs involved. Third in a series of questions for the new administration from a wide range of experts. Q. Should job creation be the primary goal of "green" investments, or do we need to rethink goals of energy investments? Should the goal of stimulus be job creation or should it concentrate on energy affordability and consumer empowerment? For example, billions of dollars could fund rebates to help families afford to install onsite solar panels, make energy efficiency retrofits to their homes (weatherization, etc), purchase more energy efficiency appliances and automobiles. Jobs would be created, but the immediate priority would be on incentives for households to use energy more efficiently and generate their own power. President-Elect Obama has emphasized so-called "flexible fuel vehicles" that can run on 85% ethanol as a way to help end our "oil addiction.” But flex fuel vehicles may not be the panacea that proponents claim. After Congress in 2005 mandated the blending of 7.5 billion gallons of ethanol into motor gasoline by 2012, and in 2007 increased that figure to 15 billion gallons by 2022, corn prices shot through the roof, raising food prices. Second, there are already tens of thousands of flex fuel vehicles on the road, and a tiny fraction of them actually run on E85. Giving incentives to automakers to produce flexfuel vehicles would be a boondoggle. And the United States now produces as much ethanol as Brazil, but we're not closer to gaining energy independence. Q. Should Obama rethink his devotion to ethanol, now that the election is past? According to the National Surface Transportation Infrastructure Financing Commission, an increase in the gas tax is necessary to avoid shortfalls in transportation infrastructure financing. Q. Is Obama willing to consider increasing the gas tax? Now that it is clear that the scientific community has consensus on the need to address climate change, the question remains: what policy will achieve emissions reductions? The consensus strategy is to adopt a so-called cap-and-trade system, where industry greenhouse gas emissions are capped at a certain level, and industries can "trade", or purchase, more emission credits if they exceed their allowance. Industries exceeding their allowance, such as the electric power sector, would then pass these compliance costs on to consumers in the form of higher prices. Q. Will Obama support raising energy prices during an economic recession to meet emissions goals -- or will dealing with climate change take a back seat to economic recovery? What alternatives to high prices -- such as mandating stricter efficiency standards for appliances, buildings and vehicles, and implementing renewable energy mandates and incentives – would he support using in place of cap and trade systems? There is much talk about the environmental benefits of a so-called "smart grid". But American 5th Amendment property rights mean that it can take a decade to site such transmission-line projects. Q. Will Obama support weakening traditional property rights for the sake of quickly siting infrastructure to help bring "green" energy to the market?